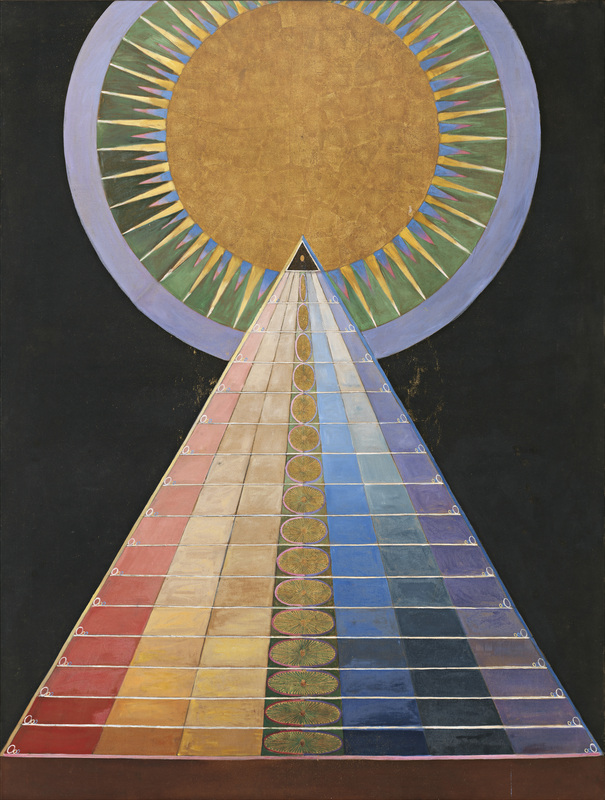 In 1905, the Swedish female artist Hilma af Klint began cleansing herself, in preparation for a series of artworks that would be executed at the directives of someone named Amaliel. More than a century later, those paintings would force a rewriting of the history of abstraction. According to the notebooks the artist left behind, Amaliel was one of several guiding spirits who spoke to her from above (and within), instructing her and even leading her hand. During her lifetime, at the behest of the spirits, af Klint produced more than one thousand works, but they remained largely within the confines of her studio. Even though she toiled as a commercial artist, painting portraits and landscapes, she exhibited only a few of the abstract paintings and drawings she created. She worried that the world wasn’t ready to see them, and when she died in a tram accident, in 1944, at the age of eighty-one, her will ordained that they not be shown for at least another twenty years. Af Klint got her wish—and then some. She remained unknown until 1986, when she was included in the show “The Spiritual in Art: Abstract Painting 1890-1985,” at the Los Angeles County Museum of Art. I first encountered her art at the Hamburger Bahnhof in Berlin in 2013 as a traveling retrospective, which began at the Moderna Museet in Stockholm. A number of her furtively made paintings were shown there for the first time, almost seventy years after her death. Now, finally, five years later, an American institution is holding the first major exhibition of af Klint’s work in the U.S. 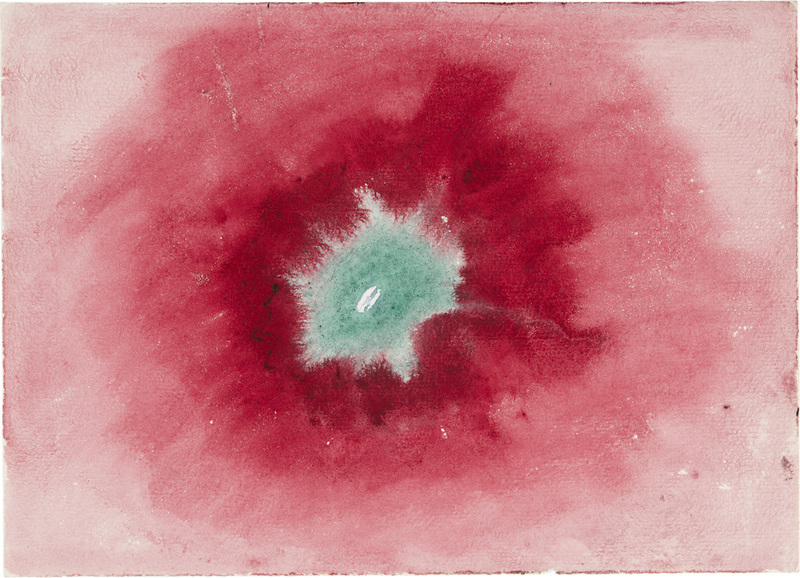 In “Hilma af Klint: Paintings for the Future,” opening October 12, the Guggenheim is presenting a hundred and seventy-five of her paintings and drawings, and seven of her notebooks. Af Klint created her central body of work, “The Paintings for the Temple,” between 1906 and 1915. It was comprised of several subseries, and totaled almost two hundred works in all. In the first one hundred and eleven paintings, made between 1906 and 1908, af Klint thought of herself as merely a channel, her hand moving without her will. Playful and imaginative, the early works, such as the largely yellow-and-blue “Primordial Chaos” group—featuring snails, spirals, and the letters “uw” (she explained that “u” stands for the spiritual and “w” for matter)—draw heavily on the symbolism of her spiritual beliefs. The Guggenheim’s rotunda gallery allows first for an intimate viewing of these small oil-on-canvas works, which are displayed side by side in two tiers, and then as you ascend the spiral, a panorama of the entire body of work reveals itself. By the time af Klint arrived to the “Ten Largest” (in October 1907, to be exact) she had shed the spiritual motifs. Her orders for this group were thus: “Ten paradisiacally beautiful paintings were to be executed; the paintings were to be in colors that would be educational and they would reveal my feelings to me in an economical way … It was the meaning of the leaders to give the world a glimpse of the system of four parts in the life of man. They are called childhood, youth, manhood, and old age.” What ensued were a series of large, buoyant, and airy canvases, some ten feet high, painted in bright colors and featuring curlicues, spirals, flower shapes, organic elements, and words written in large cursive script. Arrayed along the entrance of the Guggenheim, these works feel fresh, projecting both a determined ambition and a renegade free spirit spilled straight onto the paintings without inhibition. Despite their childlike colors, they are masterfully executed. Af Klint, after all, was a trained artist. Born in 1866, she displayed artistic talent early on and was sent to study at the Royal Academy of Fine Arts in Stockholm. It is unclear how little or how much af Klint interacted with the leading artists of her generation, and to what extent she was influenced by or an influence to them. For many years, she couldn’t travel because she was caring for her widowed mother. We know that her studio was in the same building where an Edvard Munch exhibition took place, and that she participated in one show with Kandinsky. For the most part though, it seems that af Klint worked in seclusion. She appears to have been a serious and straitlaced individual. In photographs of her as a young woman, her hair is neatly tucked in a bun and her collar is buttoned high and cinched with a broach. Later images similarly show a sternly attired but now graying woman. And yet, though she looked conservative, af Klint was nothing if not radical. In 1908, she produced a series of minimal, avant-garde abstractions, titled “The Seven-Pointed Stars.” Rendered on light background, these works depict only lines in blue, red, and yellow, which form either the shape of a flower, a circle, or spirals. In 1915, her work veered into austere, geometric abstractions. According to the Berlin catalogue, “now she was able to influence the works to a greater extent than before. Her hand was no longer guided but instead she was inspired by the words and images she perceived inside herself.” A red, targetlike painting and another with a white circle showing the slightest gesture of color set against black both have the same starkness of Malevich’s iconic “Black Square on a White Ground,” also from 1915. The “Amaliel project” culminated with three “Altarpieces,” which, as their name suggests, are laden with mystical geometries. At the Hamburger Bahnhof, they occupied a darkened room all of their own, accentuating their occultist aura; at the Guggenheim, they are sectioned off in one area and each is mounted on its own wall, and their grandiosity is slightly dimmed. Af Klint’s involvement with spiritualism, which was quite in vogue among the bourgeoisie, was entirely in step with her time. Charles Darwin’s writings, along with advances in science and technology, had turned people towards more esoteric belief systems, which offered consolation in the face of an increasingly topsy-turvy and materialistic world. 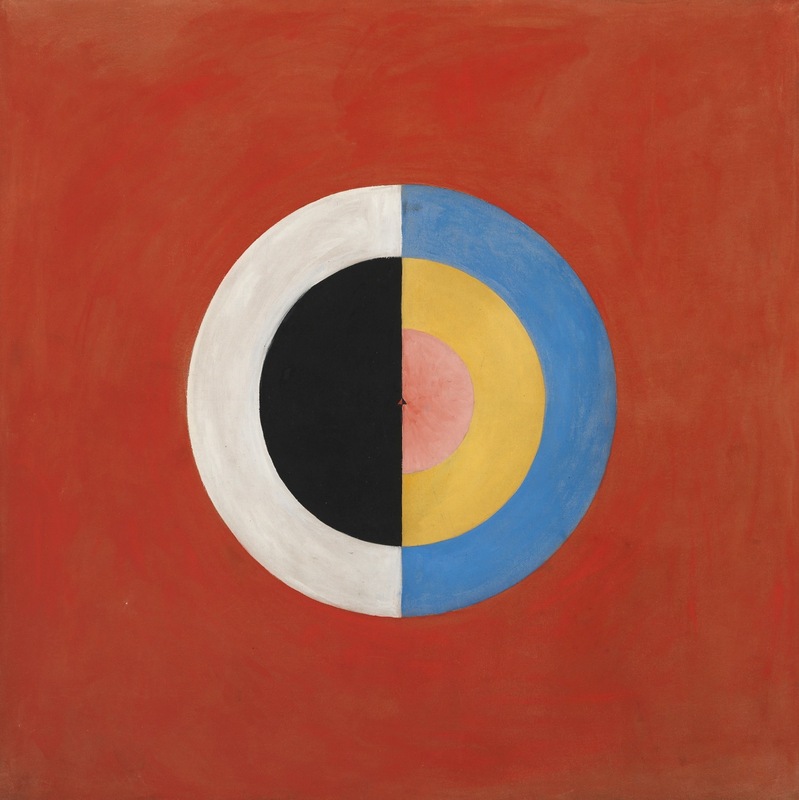 Like Kandinsky, and other pioneers of abstract art, af Klint was deeply immersed in theosophy and anthroposophy. But she seems to have taken that interest much further than her male counterparts, participating in (and later leading) séances with a group of women friends. Whatever the spirits said, af Klint did. With the works she produced through her communiqués, af Klint hoped to enlighten others about their environment and the inherent connections between life at the micro and the macro levels. In 1908, she met Rudolf Steiner, then an influential Austrian philosopher and esotericist. She tried to get him interested in her paintings, but in vain. The encounter with Steiner obliterated whatever hope she had of showing her work to the public and she stopped painting for a good four years. But she eventually found her way back. In 1922, she turned once again to watercolors. All the imagery dissolved into stains and bleeds, and the occultist references faded away. While af Klint’s abstract works remained largely obscure throughout the artist’s life and several decades afterward, her family recognized the value of her work and formed a foundation to keep safe her art and the substantive memorabilia that documented the artist’s thoughts. First spearheaded by af Klint’s nephew and now overseen by her grandnephew, the foundation provided the artworks for both the European retrospective and the American one. To accompany its show, the Guggenheim is offering a brand new catalogue. In the foreword, Richard Armstrong, the museum’s director, notes that this long-overdue exhibition “occasions an important and timely reevaluation of the emergence of abstraction, bringing to the fore fundamental questions about which factors shaped its formation, how we recount its development, and who is integral to that still-developing narrative.” That would be, incontrovertibly, Hilma af Klint. 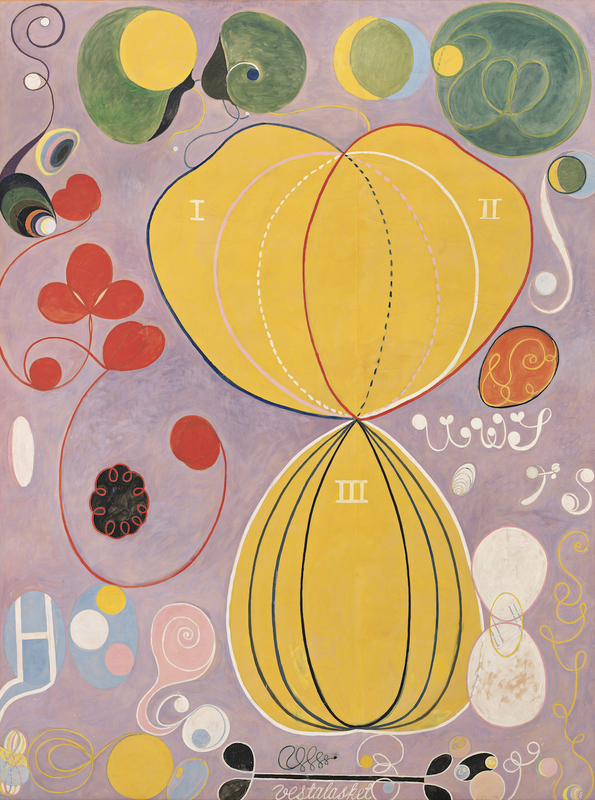 Hilma af Klint: Paintings for the Future will be on view at the Guggenheim Museum October 12, 2018–April 23, 2019. Nana Asfour is an editor at the New York Times and a former art critic.